With an A (Address) record, you point a domain or a subdomain to an IP address. 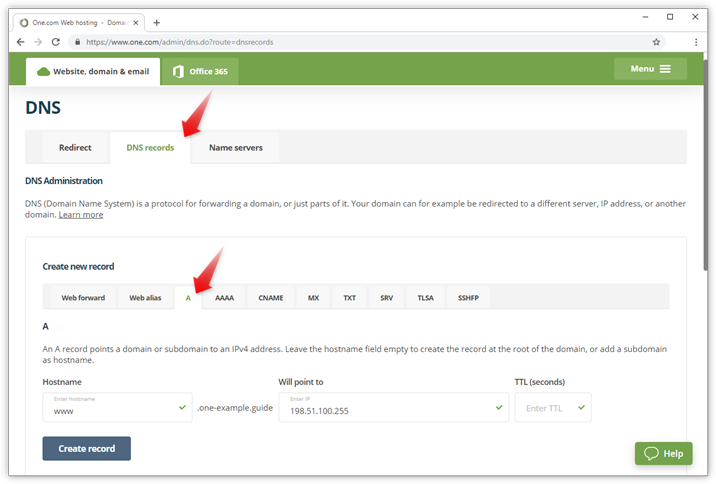 An A record is one of the most fundamental types of DNS record you can create because it connects a domain name that is easy to remember, to an internet address. You use an A record, often in combination with a CNAME, when you want to connect your (sub)domain to an external service, like Blogger. With an A record, you can only point to an IPv4-address. If you want to point to an IPv6-address you need to create an AAAA record. Click DNS settings on the Advanced settings tile. Under create new record, click A. - Hostname: leave it empty to point the domain, or enter a subdomain. - IP address: where you want to point to. - TTL: optional. If you leave it empty, it will use the default time of 3600 seconds. Click Create record to save your settings. Example: In the screenshot below we have pointed www.one-example.guide to the IP-address 198.51.100.255. The TTL is left empty, meaning it is set to 3600, which means the server will cache this setting for one hour.